The Spec and Addenda Mining (SAM) search has been a powerful tool for members utilizing the Builders Exchange Online Planroom and it just received a big speed boost! 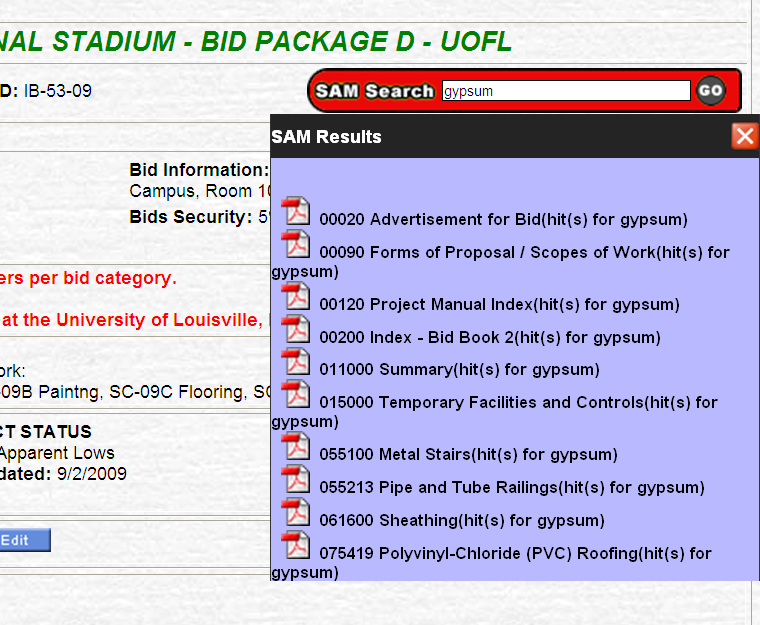 Recent upgrades to the online planroom have dramatically increased the speed of SAM Search. Previously, searches could take anywhere between 3-20 seconds to generate results. That time has now been reduced to a second or less! Furthermore, members can now conduct searches on broader terms such as concrete, lighting, and other more general phrases without “timing out” the search. SAM Search is an online planroom tool which allows members to search the entire spec book for specific keywords or phrases. Trade names such as “honeywell”, “dupont”, “prosoco” and “trane” can be located quickly and easily. Other words that are difficult to find are readily available as well, such as “retaining wall”, “valve”, “crane” and all other types of specialty work. Click here to find out how to set up a new SAM search filter or here for how to conduct a SAM Search on an individual project. Note: The SAM Search option is available only to members with upgraded memberships. Contact Builders Exchange if you would like to know more about the upgraded membership.